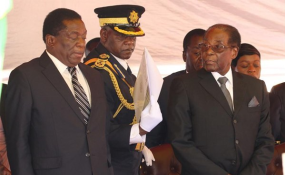 Emmerson Mnangagwa - What Next for the Reform Agenda? Will Zimbabwe's 'Dead City of Kings' Come Back to Life? Emmerson Mnangagwa and Robert Mugabe (file photo). The next six months are going to be the most demanding for the new leader of Zimbabwe, Emmerson Mnangagwa. To say the treasury coffers are empty is an understatement. Zimbabwe has massive reserves of gold, platinum and lithium, over a dozen national parks, acres of fertile agricultural land and probably the most literate population on the continent. But to kick-start meaningful production, international aid is urgent. Will Zimbabwe be joining the small club of African countries run by ex-military men who have their countries' citizens at heart and focused on national development? It is a question on the lips of most Africans who watched dramatic events of November 2017 which brought to an end 37 years of disastrous rule by dictator Robert Mugabe. After all, Mugabe's fall came on the back of military manoeuvres which have defied definition. With precision, the military executed a well-crafted plan in which the ruling party's processes were combined with parliamentary processes and widespread public support to secure "voluntary resignation" from power by one of Africa's longest serving dictators. The military men now have political control, despite the highest office being occupied by Emmerson Mnangagwa, a civilian. His deputy is Constantine Chiwenga, the former commander of the Zimbabwe Defence Forces. He is tipped to be the next president. The agenda these men have set is in every way very different from their predecessors. According to Mnangagwa, the country "has lost 20 years" and it needs to catch up. All cabinet ministers are expected to produce their ministerial plans by the end of March 2018 showing their commitment to developing the country. Their political machinery runs on very little public posturing. These are men of action and they expect results. Agriculture, the colonial mainstay of the economy, was given to the former head of the Air Force of Zimbabwe, Perence Shiri. Farm invasions by groups of unruly thugs has come to an abrupt stop. White farmers, previously driven off their farms under the Mugabe government's chaotic land reforms, have been told to present their farming plans to the Minister who is busy allocating them land. Any thug seen anywhere near these returned farmers does not answer to the police but direct to army personnel. The minister wants farmers to be ready to farm next season... without hindrance from any quarter. The chilling warning has gone out to ruling party members. All former political leaders and civil servants who looted public funds and externalised them outside the country have been instructed to bring it back by March 31, 2018. And any former leaders who currently own more than one farm have been instructed to keep one and return the rest. The punishment which will be netted out against those who refuse has not been specified but very few will want to find out. Everyone in the country knows that these men did despicable things to save the political life of Laurent Kabila in the Democratic Republic of Congo in 1998. No one wants those things to be repeated on them. To follow through on this public revenue maximisation scheme, they have just appointed a high- flying professional from the International Monetary Fund to head the country's national revenue service, ZIMRA. Professionalisation of revenue collection is key to development since it feeds the fiscus. Observers say this is key to their management of the treasury, a looting hole for the Mugabe regime. It appears revenue collection is going to be very, very serious business. Next in line is the Zimbabwe Republic Police which is undergoing massive re-organisation and restructuring, with the former commissioner Augustine Chihuri and fourteen members of his top hierarchy ruthlessly forced into retirement over a 24-hour period. Former soldiers are expected to replace them and introduce military style discipline lost a long time ago. Meanwhile, road-blocks which were used as police extortion centres are a thing of the past. If they exist at all, they are for serious offenders and the police arrogance has been replaced by polite courtesy to motorists. This has been warmly welcomed by citizens whose daily lives on the road had a become a living hell. Police officers used to demand instant cash fines which drivers paid from pathetic vending profits they earned from an economy which the Mugabe government had crushed to rubble. Could these military men be following a model set by one Paul Kagame? The former leader of a rebel army brought Rwanda's horrific and murderous genocide to an end in 1994, Kagame is a no-nonsense leader and even his strongest critics accept that he runs his country with a sincere commitment to development. The capital city Kigali is rated one of the cleanest in the developing world and the crime rate in the country is almost zero. Corruption is unknown. For a small country with little natural resources, Rwanda's economic growth for the last decade has averaged an impressive 7%, one of the highest on the continent. Kagame's party, the Rwanda Patriotic Front, may be occupied by former soldiers, but the gun has not been their weapon of choice to stay in power. They hold regular elections. The mantra for all civil servants is "to serve the Rwandan people" and collecting government revenues is serious business. It is difficult to see an opposition gaining traction for among other reasons, there may well be nothing to oppose. Almost all citizens have memories of the horrors of the 1994 genocide in which ethnic cleansing took the lives of a reported one million people. While some might resent the fact that Kagame has stayed in power for so long, few argue against his commitment to the social, economic and political stability which he has brought to the country. Ian Khama, outgoing President of Botswana will be serving the last of his two terms in 2019. Unlike Rwanda's Patriotic Front and the Zimbabwe Defence forces, who secured initial power through the gun, Ian Khama secured power via the ballot box in 2008. But he was Commander of the Botswana Defence Forces until his retirement in 1998. Upon assuming the office of the President, Khama, like Kagame has focused on the welfare of the citizens and development of the country. He has made it clear that there is no relationship between him and the old perception of the African soldier as a looter of public resources. If anything, Khama has been the exact opposite, identifying with the poorer citizens and some say, at the expense of alienating the middle class. His socialising and interactions with the poorest of the poor citizens has been dubbed populist by his critics, but overall his comment to development cannot be faulted. Khama holds very strong views about public accountability of political leaders in Africa. And he has walked the talk. To make his values clear, Ian Khama was one of Robert Mugabe's most vicious critics, in and out of regional negotiations. To Khama, Mugabe's government of looters of public resources for personal comfort represented everything that was wrong with the old African leadership. And Khama told him exactly that, to his face, in his own capital Harare. Unlike its northern neighbour Zimbabwe, Botswana is not endowed with many natural resources. The country has tried to diversify its economy away from a dependence on diamonds but this has had limited success. After all, the country is in the middle of the Kalahari Desert. But despite these limited resources, Khama has managed an average economic growth of 5% until 2015, slightly lower in 2016 and 2017 owing to lower diamond prices. But like his Rwanda counterpart, Khama has managed the little income the country receives carefully. Tax collection is very serious business and those caught involved in corrupt practices are severely punished. There had been a sense of total despair in Zimbabwe until the soldiers quietly appeared on the streets in November 2017. It was this sense of hopelessness which led many in the world to view the removal of the Mugabe regime as good for the country and its citizens. Out of desperation, an element of lawlessness was creeping into all corners of society. Then first lady Grace Mugabe, having positioned herself to take over the presidency from her geriatric husband had become the centre of the largest corruption rackets in all corners of the country. Her sense of entitlement, selfishness and disregard for accountability had become so bad that in 2017 she had privatised Mazoe, a government dam. Apart from her workers and her animals, all other citizens were banned from using water in that dam. Hence the conclusion by some analysts that it really did indeed need the authority of someone with a gun to bring the Zimbabwe society back from the brink. And it seems the men in uniform may have been the only answer in the face of a hopelessly fractured political opposition currently led by a cancer ravaged Morgan Tsvangirai. The next six months are going to be the most demanding for Mnangagwa and his officers. To say the treasury coffers are empty is an understatement. The country without revenue owes over five billion dollars to international lenders. The new dispensation desperately needs international aid if they are going to kick-start any meaningful projects which can bring economic and social benefits to their citizens. They may have at their disposal massive reserves of gold, platinum and lithium, over a dozen national parks with the big five, acres and acres of fertile agricultural land and probably the most literate population on the continent. But to kick-start meaningful production, aid is urgent for overarching requirements like infrastructure. To secure aid demands meaningful re-engagement with the West and to get this they need political legitimacy. To secure legitimacy, they must hold elections which international monitors must declare free and fair. This, their political head has promised to the international community via his wide- ranging interview with the "Financial Times" in January 2018. He has invited the United Nations and all other international observers to monitor the elections to be held in six months' time. As if that is not enough, the process of registering Zimbabweans voters in the diaspora is set to start in a month's time. Should this new dispensation introduce a trusted local currency, attract international investors, repeal the repressive legislation which restrict media freedom, open democratic space by holding internationally supervised free and fair elections, it is difficult to see the opposition gaining traction beyond 2018. It may well be that there might be nothing to oppose. Gama Mutemeri left journalism to train as a griot. This is his story this month.